For film fans, art nerds and anyone even remotely interested in make-up as an art form, Face Off is the best reality competition show on television. Presently at the end of its tenth season on the SyFy network, the show tasks special effects artists with making elaborate creatures in an impossibly short amount of time, to then be judged by some of the most revered make-up artists in the business of film. 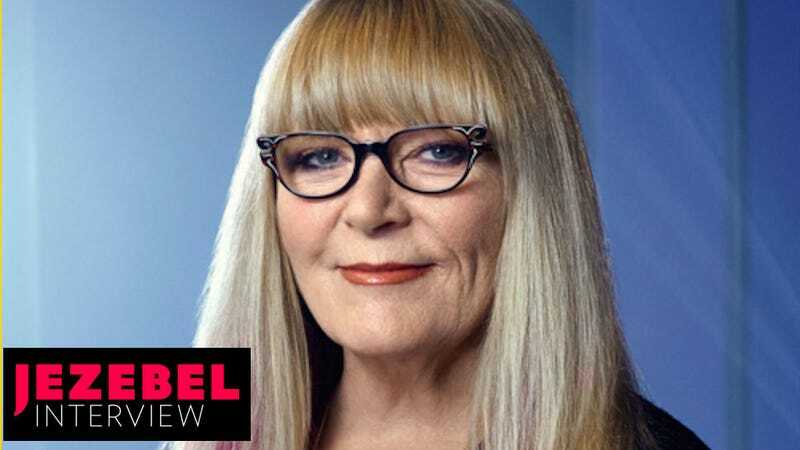 Tonight, Season 10 of Face Off will conclude in a nail-biting finale with Neill at the helm; to celebrate, Neill spoke with Jezebel about creating Beetlejuice, the FX boys’ club, and how she grew from punk rock costumer to Oscar-wielding powerhouse. The Face Off finale requires the final three contestants to develop a demon and possessed person based on a script, to be captured on film. It seems like a difficult task for make-up and effects artists who may not be used to creating for on-camera. That’s why it’s always so important to have a test make-up, and to hopefully put your character in the lighting in which it’s going to be shot, so a screen test is a really good way for the director to see how the character is going to be seen. It’s really important for both the director and the makeup artist to see how this is going to read and to make adjustments, which is what was so cool about the way we’re doing it this season: They get to see what it’s going to look like ahead of time. A couple of the directors only had minor changes they wanted to do, but I think, unfortunately for [finalist Rob Seal], his director wanted him to change things dramatically, which means a total re-sculpt. I feel so bad for him, because they have such a short time span, and whereas the other artists have the ability now to just really enhance and make what they’ve done really beautiful, Rob has to basically start over. For our audience who might not be totally familiar with make-up and special effects art—which includes myself, beyond what I’ve learned from Face Off—contestants have a finite amount of time to create their pieces. From the perspective of someone with a lot of experience in the field, what’s the pressure like with such a short amount of time? It’s horrific! Professionals don’t have to do anything that quick and if we did we’d probably all have heart attacks. But these kids whip this stuff out so quickly. I can’t even imagine how their brains work and some of them are so talented—design-wise as well as sculpturally. Usually you get somebody who’s really good at design but can’t realize the sculpture, or the other way around. Or they can design and sculpt really well, but they can’t apply the make-ups or paint them properly. So some of these young people have all of those skills combined, which I find so bloody amazing. I personally don’t have all of those skills—it wasn’t my forté to actually sculpt and do lab work. Everybody has their niche, and only a few of us [professionals] have managed to make it all the way through doing everything, like Glenn [Hetrick, fellow Face Off judge]. It’s a terrific responsibility these kids have to get this stuff out in a short amount of time. On a normal challenge, they have something like 15 to 17 hours to actually come up with an idea and get a piece out. Then they have approximately five or six hours to apply it. That’s nothing. One of the reasons I really love Face Off is because it really shows the intersection of movie magic special effects and fashion and beauty, both of which require some real fluency of fine art to execute very well. You’re painting, you’re sculpting. Exactly. You have to know anatomy. You have to know color sciences. You have to be an art student to do it all. If you don’t know anatomy, you don’t know how to build on top of a person’s face to make it look realistic—even if you’re making a creature, you have to make it so that it works. So, you’ve been doing this for a long time, and you’re at the top of your profession. It seems like the special effects, make-up artist community in film would be pretty small. Like how many people doing this occupation can America support? Not that everyone on the show is from America, but. There are so many talented people out there that I can’t see us running out of talent, really. But the show is seen in so many countries that I wouldn’t be surprised if a similar show weren’t popping up in other countries. I don’t know if it is or not, but maybe they’re going to start bringing people in from other countries, who knows, but that would be awesome. Well, this season there was Robert, who is German and my absolute favorite. He’s got such a dark, weirdo sense of humor. He is so quirky, that guy. [If you asked me] what were my favorite moments on this season, my answer would be “Any scene where Robert is speaking.” I mean, this guy is so bizarre and he had a name for every character. He was so entertaining—I just wish he would have been better at doing his make-ups! I was so sad when he got the boot. I know, we all we didn’t want him to go because he was so entertaining, but, you know, his make-ups ultimately didn’t hold up to the work of some of the other contestants. Some of the work, though, seems like it could walk off the show and right onto the set of a movie. What have been some of your favorites through the seasons? There have been so many gorgeous make-ups on the show, but one of my all-time favorite challenges in general was the Tim Burton challenge. There were just some really beautiful, great, fun make-ups—especially the guy who was the bellhop with drawers in his chest. I don’t remember if [the producers] ended up taking it out or not, but at one point he whipped out a bra and put it on my head when we were up looking at him and I thought I was going to die laughing. But we just have so many unusual, fantastic moments on this show. People with talking bellies, all kinds of crazy stuff. You’ve worked on so many Tim Burton films, how is it to judge that category in the competition? You’ve created so much for him. Let me clarify some of my work with Tim Burton, who is an artist himself. Usually when I’ve come into the picture, they’ve already got the characters designed. I think probably one of the first things I did with Tim where it was a little bit more of my handiwork than his was Beetlejuice, the very first time I worked with him. He had sketches of what he thought Beetlejuice should look like, which was not anything like what he wound up looking like, because Tim realized that what he wanted was a derelict bum hanging out in an alleyway, and what he got was a very wacky-looking character that I basically designed. But Tim has really got his own aesthetic, and it usually has something to do with dark eyes and very pale skin. So a lot of the characters that I’ve done for him are exactly that. Edward Scissorhands, for example. That whole make-up was basically designed ahead of time at Stan Winston’s company with Tim. We all worked together really well over the years. I also did the Penguin character for Batman Forever with Stan, and with Tim we created a lot of really iconic characters. Tim, as I said, is an artist and he basically will come in ahead of time and say this is what we want, and then [someone] will do the sculpting and then they’ll give me the make-up, which I bring the vision to life with with Tim. I believe that the make-up artist is the tool of the director, and that we actually bring directors’ visions to life. Of course, I have done my own things. For example, on the first Amazing Spider-Man with Rhys Ifans, originally we were only supposed to have one little detail of a prosthetic on Rhys’s neck after he transforms in and out of The Lizard. I thought, well, it’s really odd that he would go in and out of this character and still only have this one little spot. So the big mouth that I am, I went to the director and said, “Marc [Webb], I really think that after you know Rhys is going in and out of this transformation that he should have more prosthetics on him. He should have more of this creature that he can’t seem to get rid of because, you know, it’s melding with his DNA and he’s having a more difficult time transforming back, so I really think it would be really good if every time he comes in and out of this make-up you’ve got more left on his face or hands or something”. Marc looked at me and said, “Ve, are you trying to rewrite the script?” [Laughs] But he said, you know what, you’re right, but I don’t think we have any more money to make more stuff. I said, don’t worry, I’ll Frankenstein it all, I’ll steal things from other actors. Because we had a lot of police officers that transform at one point or another, so I literally stole prosthetics from all these other actors’s make-ups and just basically Frankensteined them onto Rhys to make the transformation pieces. It worked really cool, and it was so much fun to do. I love that you sort of DIY’d the make-up on a multimillion dollar film. You’ve been doing this since the ‘70s, and the art of effects make-up must have changed so much. How does, say, CGI work with the act of doing organic make-ups? I think that there’s definitely a place for CGI—certainly with creatures that could never be human, because putting a human in a in a character suit only works to a certain extent. And CGI integrated in the make-up definitely has validity. We used it in the Pirates of the Caribbean for the Bootstrap Bill character, because initially they wanted Bootstrap Bill to be total CGI when he was sort of transforming. But Stellan [Skarsgard] felt that being in the makeup would be much better for the character because he felt like he could act better in it. So we kept elevating his make-up, and we never did make him into CGI. All they did was add little elements of things—squirting and stuff like that. The CGI artist worked very closely with us when we got into Davy Jones and all of those characters, and they fashioned the look of the CGI off of the makeup that we created for Stellan. So all those characters looked like they were from the same world. But I still prefer the organic look of a make-up, because it’s so much more realistic. How did you even get into this job? I lived next door to a make-up man and I’ve known since I was five years old this is what I wanted to do. He was my inspiration, but unfortunately for me, women didn’t do make-up basically. Of any type. Women could only do hair, or body make-up. I never got that. So I just sort of fell into the music business because I was hanging around those types of people when I was young. When I was 19, I opened up a vintage clothing business, and I started collecting clothing for rock bands. Eventually I started making costumes for local bands, and one L.A. band had a sort of space theme. So I started making cool space costumes, dyed their hair, gave them wacky haircuts. This was the ‘70s. They said, this is all really cool, but we really want big heads and pointed ears and the crazy look from Outer Limits. I said, OK. I don’t know how to do it but I’m going to go find out right now. I literally went on a scout to a science fiction convention and I met these guys who had these Planet of the Apes looks on. I walked right up to him and I said “This is really cool. Where’d you get those masks?” And this one guy looked at me really indignantly and he said, these aren’t masks. They’re make-ups. “Really cool. Where’d you get them?” He said, We made em. I said, “Please teach me,” and the rest is history. I forced my way in. I always thought there was something pretty punk rock about you, Ve. So the boys’ club aspect of it—has it adjusted itself? Well, let’s put it this way. There are a lot more female makeup artists who actually know how to apply it really well now, but not so many that have their own studios. So it’s more of a boys club thing when it comes to actually owning a studio, and I think that all stems from the fact that it comes from the higher-ups, like the producers. I don’t think a producer is going to go to a woman to have them do creatures for them. That’s not to say that Nora, one of our prior winners, couldn’t open up a big studio and do really well. But the boys’ club starts at the top. It’s wild, too, because you in particular have had such an impact on culture. You’ve worked on some of the most iconic films of our time. No one will remember who produced a movie, but everyone will remember how it looked. I have a perfect example in the character of Beetlejuice. I mean, little kids know who Beetlejuice is, and I did that probably 30 something years ago. We were like the bad child that stuck out at Culver City Studios because Warner Brothers didn’t want to have anything to do with us, and turns out we pulled it out of the shitter, basically. Seriously. Can I ask you about some more recent inspirations? Like Pee Wee’s Big Holiday, which I loved. You’ve been working on Pee-Wee Herman films and television for years. What role did you have in the most recent one? It was very interesting. We had our challenges with that, because of course [Paul Reubens] is in his 60s. He is no longer in his 30s. So I had to make adjustments on him and find some really fantastic products that would make him look more youthful. But we also used a lift made with silk—and this is where CGI comes into effect on a make-up job, because he has a lot of CGI done to him on this film. Not so much in the medium shots, but in anything close up, he has had major CGI worked on him, almost to the tune of $2 million through the whole movie. He talks about it all the time, it’s nothing that he’s tried to hide—he says he’s the poster child for CGI. I worked really closely with the CGI artist on that to explain to him what he had to do to make Paul look like he did in Big Top Pee-Wee, which I also did with them. In looking at the pictures of Paul now and the snapshots from Big Top Pee-Wee, I realized that over the years there are certain parts of our bodies that keep growing when we get older. So they had to make the ears smaller and, in some of the shots, they had to make his nose smaller. And also the face gets a lot more texture in it when you get older, so they had to smooth out some of the texture in the skin as well as remove some of the wrinkles. Paul doesn’t look bad now, because if you’ve seen him on some of the talk shows recently, he looks really great. Yet he doesn’t look like he did 30 years ago. So these are all really subtle techniques that a good CGI artist can do. And as far as all the other characters go... I don’t know if you realize this, but you remember when they were in the snake farm? In the snake farm, there was a sort of short and chubby lady and a tall and skinny guy, right? The short and chubby lady was Miss Yvonne. I did a character makeup on her to make her look really awful. [Laughs] So that is the power of make-up, right there! The Face Off Season 10 finale airs Wednesday, April 13 at 9/8C on Syfy.